Hunting for a new sweet treat to make for dessert? You’ll absolutely love our creamy Greek yogurt frosting—it’s made using Greek yogurt, which helps to keep the frosting mixture creamy and moist. We suggest pairing this yogurt-frosting recipe with our recipe for carrot cake. Trust us, you can’t go wrong with this one! The recipe makes ¾ cup of frosting, or enough to cover a single layer of an eight- to nine-inch cake. After trying this recipe, do us a favor—share it with your friends and family on Facebook, Pinterest or Twitter. We hope they love it! Ready to make some Greek yogurt frosting? 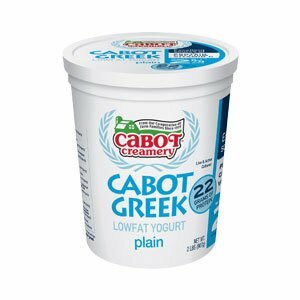 To make this recipe you’ll need three tablespoons of Cabot two percent Plain Greek yogurt or Cabot plain Greek-yogurt—if you’re looking to cut down on the calories, we suggest going for the former over the latter. You’ll also need a half-teaspoon of pure vanilla extract, a quarter teaspoon of xanthan gum and 2 - 2¼ cups of confectioner’s sugar, depending on how sweet you want the frosting to be. Making the recipe is very straightforward: you should start by placing the yogurt and the vanilla into a medium-sized bowl. Then stir in the gum, and add the sugar too. We suggest using an electric mixer, set on high speed. Once you’re done, the final result should be stiff but spreadable. Greek yogurt can be used to make a wide range of frostings and creams. If you’d like to make a cream recipe, we suggest making our whipped yogurt cream recipe. 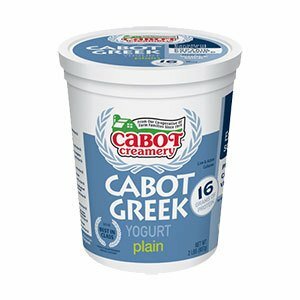 Cabot is a cooperative of 800 farm families, and collectively, we’ve been making dairy products for generations. From our sour creams to our cheddar cheeses, we take a great deal of pride in crafting a wide range of and award-winning dairy products. We hope you enjoyed our Greek yogurt-frosting recipe. We’d love to hear your thoughts about the dish. After making it, please feel free to rate and review it. PLACE yogurt and vanilla in medium bowl. Stir in xanthan gum, if using. BEAT in confectioner’s sugar with electric mixer on high speed, adding enough to make stiff but spreadable frosting. Spread on cake immediately and let set. Try with our Carrot Cake. Icing is similar to a thick glaze, flavorful and no fat. It would be helpful if your nutrition facts included what the serving size is.